Cast iron grenade which could also be used as a rifle grenade. The detonator had to inserted before use. It had an "always" fuze that functioned like a No247 fuze. 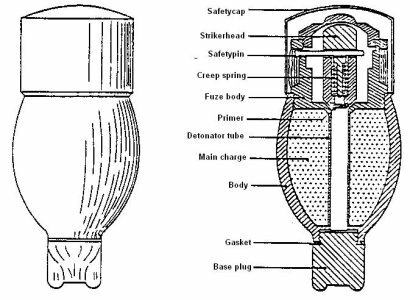 This grenade was tested in the field during 1917 en 1918 but was rejected and not taken in production. Weight 603gram including 35gram filling. Photo below © Norman Bonney.